My grandfather taught us the art and science of fishing with minnows and cane poles, while my father, a tournament angler, spent time teaching us how to use the traditional rod and reel. Both of these great men in my life exhibited tremendous patience and love as they passed down their angling skills to the three of us. Fortunately, they did not have to teach all of us at the same time due to the differences in our ages. Otherwise, the patience they had would probably have been challenged more than it was. Last month, the city of Corsicana Park and Recreation department, under the leadership of Sharla Nelson, hosted a Kid Fish program at the new IOOF park. Although I don’t have an accurate count of the number of kids and parents in attendance, it was clearly over the 250 mark. Hats off to the Parks and Recreation department for a job well done. It was run smoothly, professionally and the park was in immaculate condition. They even saw to it that the lake was stocked with channel catfish in order to ensure greater fishing success for the kids. In today’s busy society, it seems that parents have less and less time for their children. It was refreshing and encouraging to see parents and grandparents bringing youngsters to the park for a morning of fishing. Prizes were presented for a variety of age groups and size fish weighed in and measured. Thanks to those of you who took time out of your busy schedules to bring your kids to the Kids Fish. It was quality time, well spent, with our most important resource, our children. The message is strong. As adults that enjoy the outdoors, we often find ourselves using the time we spend outdoors as a form of therapy, at least I know I do. Leisure fishing provides me an opportunity to temporarily clear my mind of the day to day challenges I face, relax and recharge my batteries, so to speak. The same holds true for our young people that are facing more and more pressure from peers, education and society. Additionally, you’ve often heard it said that our children are our future. The same is true about the sport we love. The future of fishing is our children. In order to keep the heritage of fishing alive, we must take time to pass on our skills and knowledge about the sport we love to the next generation. That’s correct, I said “take time”. None of us have time anymore. You must establish your priorities and your family should come second only to our Heavenly Father. Rusty has taken his calling to a national level with the Kids, We Care program. I would challenge you, as an outdoors lover, to make time to take a youngster fishing, locally. Pass on the tradition. You’ll make memories that both you and the kids will cherish for a lifetime, I know I did with my dad and grandfather. My dad and I are still making those memories. Last weekend, we fished a Skeeter boat owners tournament together at Lake Fork. We didn’t win any money, but we had two and a half-great days together. If you don’t have children or if yours have grown up and gone, find a kid and change their life forever. Teach them to fish or help them hone the skills they already have. If you are a member of a bass club, I would challenge you and your group to get involved with the youngsters in your community. 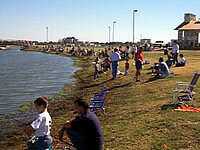 Try holding a half-day youth fishing tournament. You’ll be amazed at the response you get and the joy it will bring to your heart watching little ones get so excited. Many of our fishing industry leaders are happy to assist you with products for prizes. The future of our nation is found in the hands of our children. The future of our sport is also in the hands of our children. In both cases, it is our responsibility to train those little hands and help them grow. Give a kid a fish to catch and you feed his character for a day, teach a kid to catch fish and you will feed his character for a lifetime. Until next time, enjoy the great outdoors!